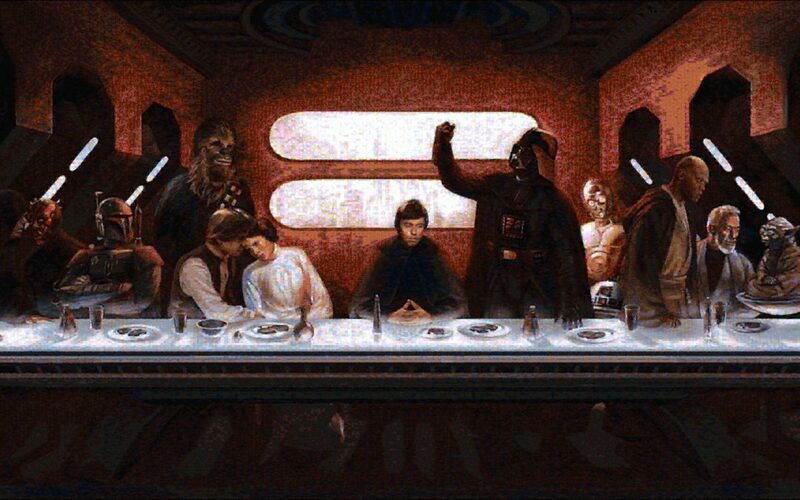 Star Wars Last Supper Mosaic (New) | Avi And Robin! I did it. For the countless e-mails I’ve received, for my love of big projects, for Star Wars, and for myself. 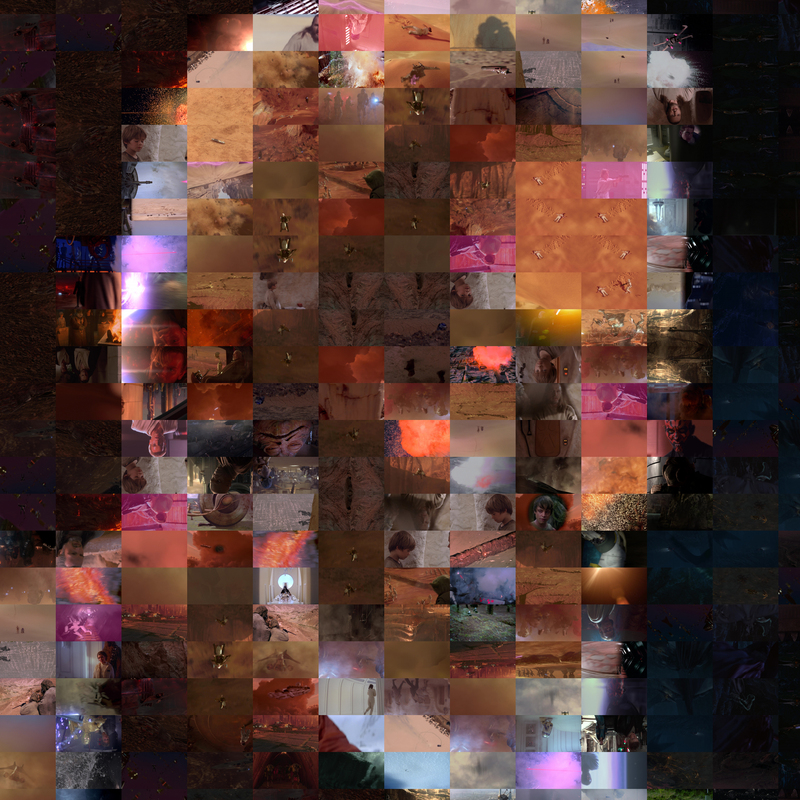 I remade the star wars mosaic. Admittedly, I did not spend as much time creating it as I did the first time. Whether it’s because I’m better at it than I was, whether I was just lazier and didn’t take as much care, who knows. I have created a few print size downloads, one is 300 dpi , one is 600dpi, and one is 900 dpi. Continue reading for the download links and more screenshots. The original was about 69k images. Due to the newer movies used and the slightly modified aspect ratio, the new version used exactly 70448 images. I hope you like it! (5184×2338 pixels, 10.4MB) I recommend Right Click and Save As. HOLY CRAP A LOT OF PEOPLE ARE TRYING TO DOWNLOAD THIS. Please hold momentarily, I’m mirroring all the files as fast as humanly possible. 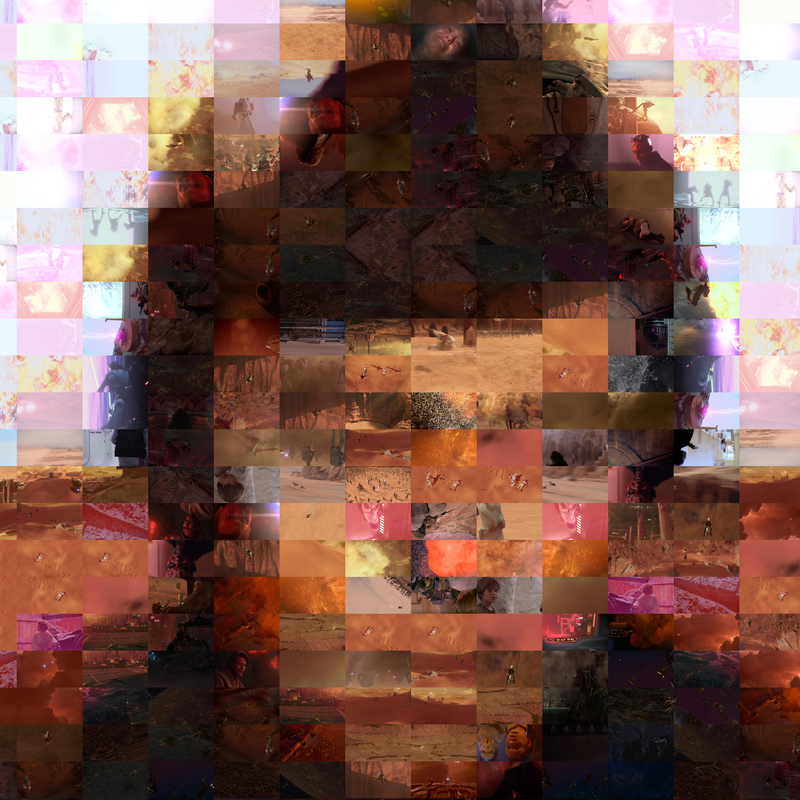 I apologize for the downtime, but the 300dpi, 600dpi, and 900dpi versions will be up fast as Han does the Kessel Run. Again, I’m terribly sorry for the temporary downtime. Thanks Jesus Diaz for once again crashing my website hahahahaha. I really do love Gizmodo :p. I’m uploading the files to media fire, and setting up a torrent. The torrent is preferable, but mediafire should work as well. Media fire mirror downloads coming soon (Hopefully less than a day). The mediafire links are dead for whatever mediafire reason, and the torrent doesn’t seem to have a ton of seeders. I’m uploading everything to my public dropbox, hopefully I don’t cap my download limits now that this post is a little older. Dropbox link is below. In case anyone is wondering, the original was 1200 dpi. If lots of people request I can re run the algorithm and do it, but it’ll take a damn long time. It’s also not really necessary unless you plan on printing this at absolute full size from a professional printer (which will probably cost quite a pretty penny). The original is also on my website here, and was featured on GIZMODO, as well as several other sites. Edit: As promised, here’s the mirror for the HTTP Downloads. I STRONGLY recommend the torrent, it’s got a healthy fill of seeders and it will download FAR faster dropbox download. (21600×9743 pixels, 602MB) Definitely Right Click and Save As for this, as your browser may try to open the tiff on the fly. I’m not responsible for crashing web browsers or computers. The full size is in .7z format, and I recommend 7-zip from 7-zip.org to decompress it. As a special treat from the requests people made, I issued out a 900dpi version. Unfortuantely, tiffs are not able to operate over 4GB, or so Photoshop claims. It’s a PSB, so I apologize if you can’t use it, but a printer should be able to. The full size of this one is 64798×29227 pixels. Download 72dpi, 300dpi, 600dpi, and 900dpi versions here. Wow, what more is there to say? Great work! Any chance that you re-upload the high resolution tiff files? You are an amazing creative person my friend. I am thrilled and amazed by the level of detail here. I was wondering if I could have your permission to compile these into a torrent file for distribution? All credit would be yours of course. Sure! I contemplated doing it myself, but I was too lazy. If you do, shoot me a message and I’ll link to it here! AMAZING. Can’t wait for the print-rez versions. Going to print it out as a mosaic, stich it all together, and send it to a friend who is going to flip out when she gets it! I could look at this all day. When will the 1200 dpi original be up? Also with the torrent above, what exactly am I downloading that is 7.35GB? the 1200 dpi version won’t be up for a long time, if ever. I’m traveling cross country back and forth for about a month on business and won’t be able to even touch it until afterwards. The 900dpi print is amazing quality, no worries on that regard. Please make the 1200 dpi image available!! I would love to have that printed up full size for my son. He’s a huge Star Wars fan! the 900 dpi is still great quality and quite huge. Honestly, most printing places will only be able to print it at 300 dpi, and since that’s the case and the original design is for 72″x36″, you could realistically print it at 18 feet wide, by 9 feet tall. if you wanted, but that’s kind of ridiculous. If you go to a professional printer that’s actually capable of printing in higher quality than this, it will probably cost a small fortune to get it done (but the quality is DEFINITELY noticeable). Any news on the mirrors of the high res version? Maybe media fire or rapidshare? You know, it’s my fault. I totally forgot. They’re up now! Thanks for the reminder. thanks! Totally slipped by me! It should be working properly. Everyone needs to look at this. It’s AMAZING. Thanks for your work, Avinash Arora. Mediafire really shafted me, and I couldn’t care for their customer service as well. They blatantly lied to me, and so I refuse to give them another cent. The torrent is definitely still active, I’m seeing 22 healthy seeders still. Wow, that’s so cool! The 300dpi link doesn’t work – could you please re-post it?? Thanks for letting me know! I’ve just fixed all the broken links, Mediafire removed them presumably due to age of the files. I put them all on my dropbox, including the higher resolution versions! Thanks I just downloaded the zip file, I am gonna print it and frame it, as soon as I have it I will share it in the “customer appreciation” menu, thanks again !!! Yes please! I’d love to see it! Hi Avinash. Is the file still available to download? If yes, could you share the latest link as the dropbox links are no longer working and neither is the torrent. The LINK doesn’t work. State that the file is no longer available. Where can we find it?